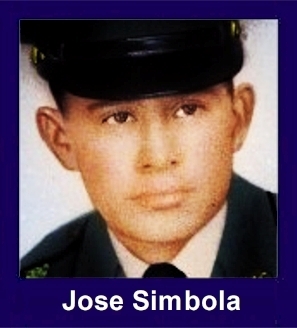 The 35th Infantry Regiment Association salutes our fallen brother, PFC Jose Scotty Simbola, who died in the service of his country on June 17th, 1966 in Pleiku Province, Vietnam. The cause of death was listed as Small Arms/AW. At the time of his death Jose was 20 years of age. He was from Penasco, New Mexico. Jose is honored on the Vietnam Veterans Memorial at Panel 08E, Line 58. The decorations earned by PFC Jose Scotty Simbola include: the Combat Infantryman Badge, the Bronze Star with V, the Purple Heart, the National Defense Service Medal, the Vietnam Service Medal, the Vietnam Campaign Medal and the Vietnam Cross of Gallantry with Palm Unit Citation. For heroism in connection with military operations against a hostile force. Private First Class Simbola distinguished himself by heroic actions during an ambush patrol north of the Ia Drang river near the Cambodian border on 17 June 1966. Stationed on the right flank of his squad's ambush site, Private First Class Simbola was the first to discover an enemy unit of superior strength approaching the ambush position. A heavy fire fight developed. The enemy force quickly began deploying to surround his squad. Private First Class Simbola made a quick and correct estimate of the situation and moved to a position from which he could bring fire on the enemy and also prevent them from overwhelming his squad. In the fight which ensued, Private First Class Simbola was killed. However, the job that he started out to do was accomplished since his squad was given a chance to reorganize and move to a more tenable fighting position. The initiative and inspirational courage displayed by Private First Class Simbola are in keeping with the highest traditions of the military services and reflect great credit upon himself, his unit, and the United States Army.